No, that wasn't a typo—Loki has indeed wielded Thor's hammer! We know what you are thinking and you're correct! It would take some insane weirdness and arcane trickery for this to happen, but when you're talking about comics, that kind of goes without saying. During the 2014 X-Men/Avengers crossover event Axis, several members of the team were hit with an inversion spell, which converted good to evil, and vice-versa. Two very powerful entities were engulfed in the spell: Thor and Loki. With their roles now reversed, Loki becomes a hero who temporarily joins other former villains such as Sabretooth, Magneto, Doctor Doom, and others in a new team called the Astonishing Avengers. Thor, meanwhile, takes up with a group that settled on The Axis of Evil Avengers alongside folks like Captain America, Luke Cage, and Iron Man. It reads as confusing as it sounds here, but essentially we have an evil Thor and a good Loki on opposite sides with a lot of mess to clean up. Loki: Agent of Asgard #9 continues this story with the following, "As Thor fell from grace, Loki was transformed into a warrior for the side of right, a hero for the ages…Loki found himself against his brother, thrust into the role of champion of all things noble." This meant that Mjolnir, which had rejected Evil Thor for being, well, evil, chose Good Loki as its new champion, and wield it well he did against his brother. Of course, all good things must come to an end, and this instance is no exception. Once the spell was lifted, Loki once again returned to his evil, mischievous, unworthy ways that we all know and love him for. In the films, Captain America couldn't move Mjolnir more than a little bit, but Comic Cap has grabbed Mjolnir multiple times over. In Thor #390, Avengers Island comes under attack, and Thor is there to offer aid. The invading minions of Grog subdue most of the Avengers and, at one point, Thor is separated from Mjolnir. 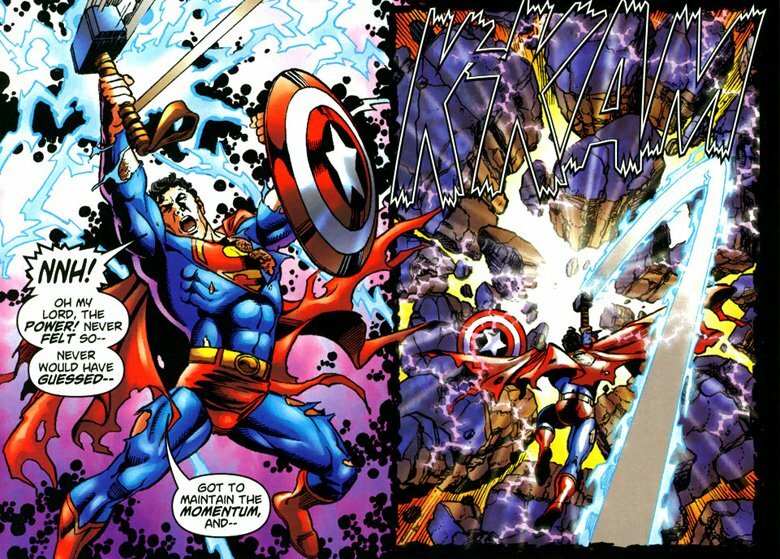 Cap is then able to grab the hammer and wield it for a short time, before returning it to Thor. This marked the first time a human could wield the hammer, and was also used as a plot device. Cap was in a bad place with the Avengers at the time, due to previous events, but his being able to pick up and wield Mjolnir convinced Thor he was a worthy man, and could indeed be trusted. 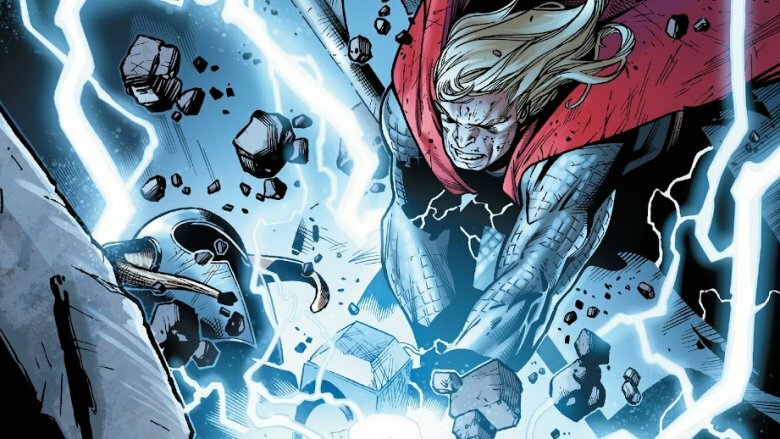 The second time Cap lifted Mjolnir occurred in Fear Itself #7, during the final battle with Cul. Thor chucks the hammer at Cul, but it's deflected with an energy blast. Cap again goes over and picks it up, showing he's still worthy. Unlike others, when he picked up the hammer, he didn't transform into Thor or gain his costume, which suggests this was more about moving the story forward than anything else. Still, if Steve Rogers isn't worthy of the power of Thor, who is? It turns out that the idea of characters being worthy enough to lift Mjolnir isn't actually limited to a single reality. 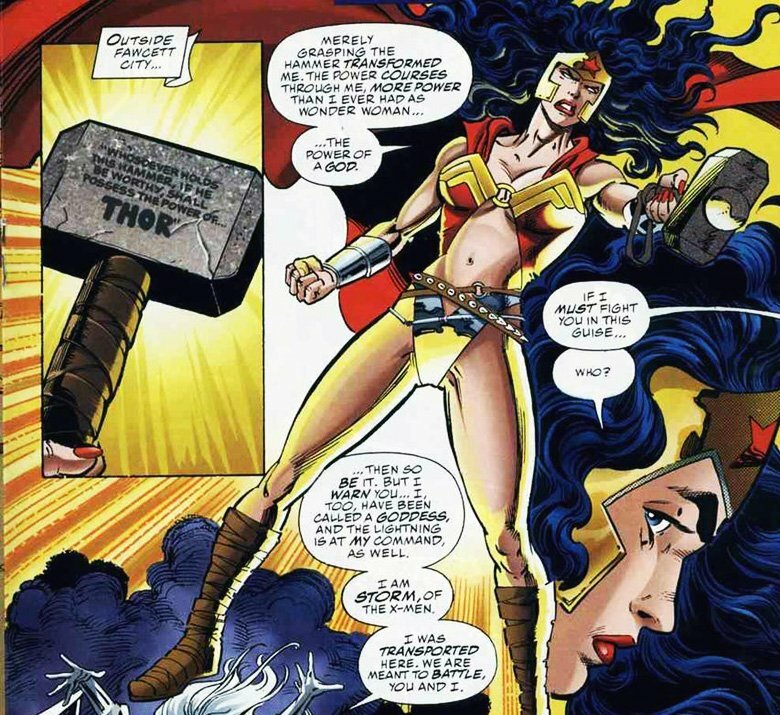 In 1996, during the DC vs. Marvel crossover event, Wonder Woman stumbled across Thor's hammer and hefted it almost effortlessly, adding the God of Thunder's power to her own, and getting a new costume that … well, that really reminds you that this thing was published in the mid-'90s. In theory, this rules. The idea of pitting a character inspired by Greek mythology and filtered through DC comics against a character inspired by Norse mythology filtered through the Marvel Universe is the perfect kind of epic clash that you want to see from an epic crossover like DC vs. Marvel. Unfortunately — or appropriately, depending on your point of view — Wonder Woman was matched up against Storm of the X-Men, while Thor took on Captain Marvel (better known now as Shazam) since they both had a lightning motif and powers inspired by mythology. That makes sense, considering that Storm was easily the most popular and prominent female character at the time, as evidenced by the fact that she won the fan vote that determined the outcome of the series, but it also made the momentous occasion of Wonder Woman lifting Thor's hammer come off as an afterthought. After swinging it around for a couple of panels, Wonder Woman dropped the hammer so that she could take on Storm in a fair fight — and putting herself at a disadvantage in a way that gave DC an easy excuse for having their most prominent female character take the L.
If Wonder Woman picking up Mjolnir suffered from being an afterthought, Superman's turn at wielding the power of Thor was exactly the kind of climactic moment it should've been. That should've been expected, though: in four oversize issues, Kurt Busiek and George Perez's JLA/Avengers was full of moments that fans had been wanting to see for decades. Two issues after they fought each other in a knock-down, drag-out brawl, Superman and Thor had earned each other's trust, just in time for the Avengers and the Justice League to get into a full-on team-up. As Thor was overwhelmed by enemies from both universes, he threw Mjolnir to Superman — who was already wielding Captain America's shield — and shouted, "Do thou well with it!" Armed with the power of Thor, Superman was able to shatter an entire fortress in a single blow, paving the way for the battle against the book's final boss, Krona. After the battle, though, we got a moment that might be even better than Superman swinging the hammer. When Superman went to pick it up so he could hand it back to Thor, he found himself unable to lift it, with Thor casually explaining that Odin must've just lifted the enchantment since this was a special one-time-only emergency. Superman might've been worthy, but let's be real here: that's the sort of thing that you can only really do once. Most readers are familiar with the story where Thor turns into a frog for a couple of issues, if only for the fact that it produced some of the weirdest covers Marvel ever published. The thing is, that story actually rules, a bizarre little fairy tale adventure that finds the Frog of Thunder teaming up with a bunch of other frogs in Central Park to fight off an army of sewer alligators before finally recovering his hammer. 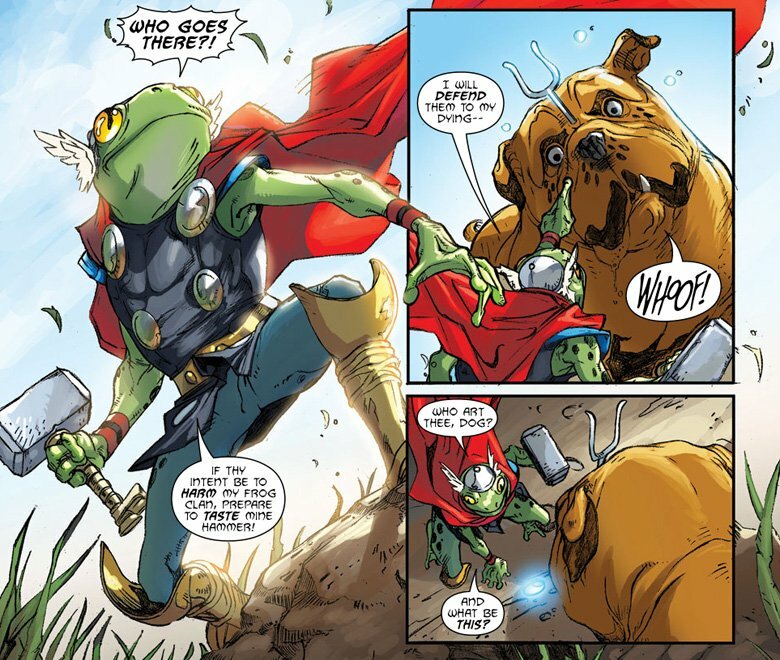 What most readers might not know, however, is that one of those frogs, Puddlegulp, actually became a version of Thor himself. In the original story, it's hinted that he's a human being who was also turned into a frog, and in the pages of Lockjaw and the Pet Avengers — in which the Inhumans' teleporting dog led a team of animal superheroes that also included the Falcon's falcon and Speedball's cat, Hairball — he got a much more detailed origin story. Simon Walterson, named for legendary Thor writer and artist Walter Simonson, was a football player whose career was ended by an injury. He was turned into a frog by a mystic after he couldn't pay his debts but ended up accepting his fate and enjoying his life as a frog. After meeting Thor and helping him regain his hammer, though, Puddlegulp grabbed a shard that he had chipped off Mjolnir himself during a fight with some sewer rats. It might not have been the whole hammer, but it was enough to turn him into Throg with his own tiny version of Mjolnir, complete with the inscription about worthiness. In other words, Thor's back — in frog form! 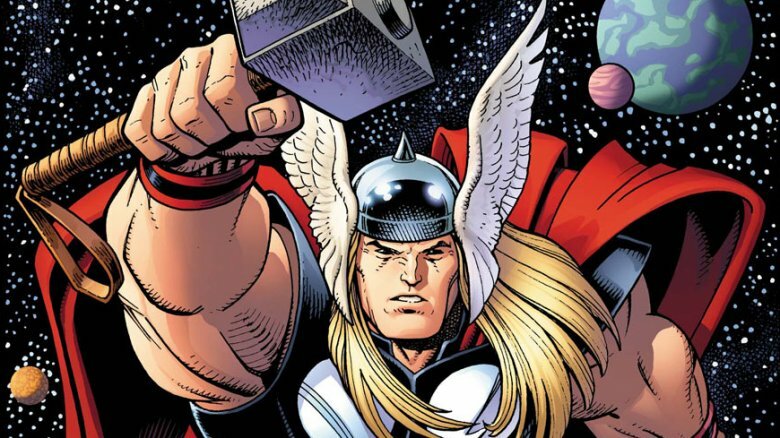 By 2016, it was time to welcome a new Thor to the Marvel Universe. 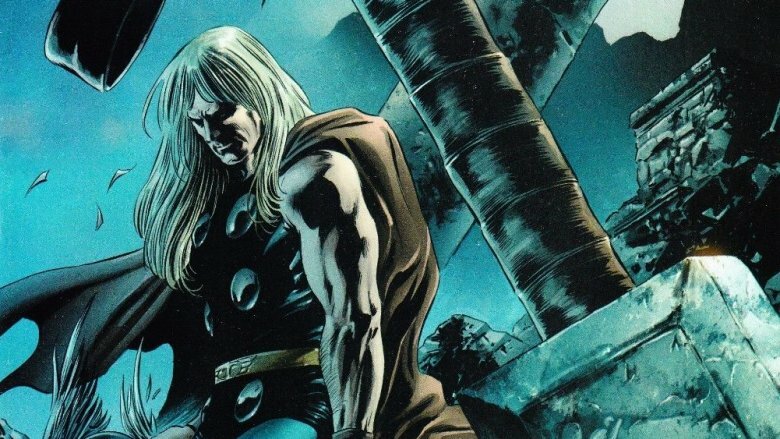 The preceding decades saw Thor killed, cloned, and unarmed—literally, his left arm was cut off. Deciding to take the character in a new direction, none other than Donald Blake's girlfriend, and longtime associate of the Thor universe, Jane Foster, picks up Mjolnir and becomes the new Thor, Goddess of War. 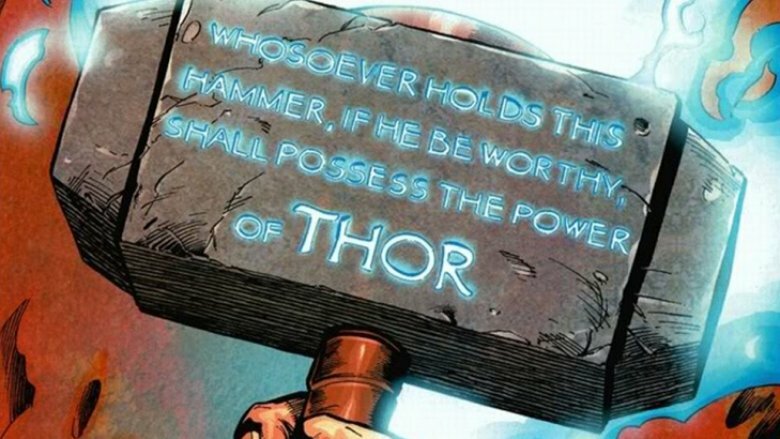 She even altered the inscription on the hammer to read, "Whosoever holds this hammer, if SHE be worthy, shall possess the power of Thor." After Foster picks up the hammer and becomes the new Thor, the original God of Thunder attempts to reclaim his hammer and title. After he finds that he's unable to take back his hammer, he relinquishes the name of Thor and takes on the title of Odinson. He also adopts the Asgardian weapon Jarnbjorn alongside a prosthetic arm to continue his superhero lifestyle. Meanwhile, the newly-crowned Thor, Goddess of Thunder, faces new challenges and goes on to join the Avengers, but maintains her secret identity. 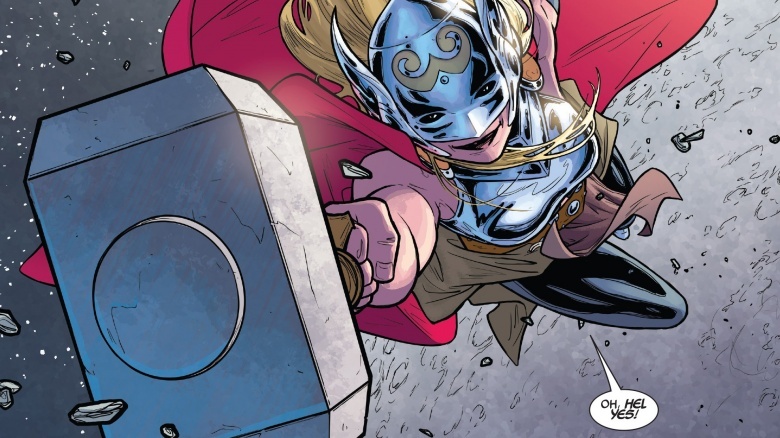 Basically, Foster now has all of Thor's powers, with no limitations, and also has demonstrated a unique method of control over Mjolnir that her predecessor never achieved. She is able to alter Mjolnir's velocity and trajectory in mid-throw and can even cause the hammer to spin around an enemy at great speed, trapping them. Sounds worthy to us! In what was planned to be the final conclusion to the 2099 storylines, Marvel published 2099: Manifest Destiny all the way back in 1998. The book was a one-shot meant to address the remaining storylines, and close out the characters and the 2099 universe entirely. In the story, Miguel O'Hara (2099's Spider-Man) is running the formerly evil corporation Alchemax, and has Mjolnir in his possession. He awakens Captain America and pleads with him to accept the hammer and become the embodiment of both symbols: Captain America and Thor. After some reluctance, Cap agrees and becomes Cap-Thor! So that's Cap With Hammer #3, from a certain point of view. The newly christened Steve Rogers then goes on to inspire hope in people around the world. During an epic battle alongside Uatu, The Watcher, Cap gets flung so hard into space, he leaves the Solar System. He hurls Mjolnir to Miguel who catches it, but does not become the new Thor. He realizes then that, since he can wield the hammer, he is indeed worthy, but one who needs to remain a bureaucratic hero, and not a physical one. He goes on to run Alchemax for the greater good and benefits all of mankind. The book then spans the following millennia, and shows all the good these 2099 folks have done. 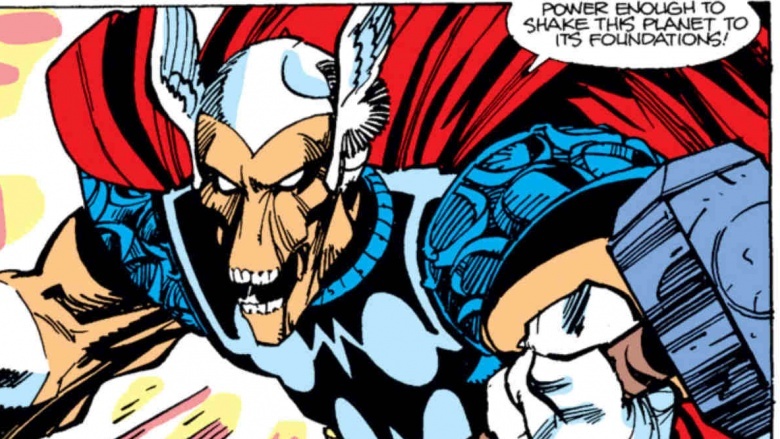 Every so often, comics need to shake things up, such as with the introduction of Beta Ray Bill in Thor #337. 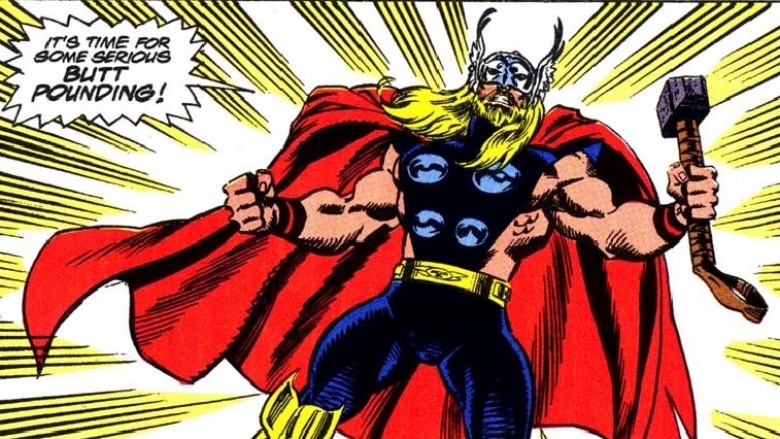 Bill's introduction introduced the possibility of there being more than one worthy of wielding Mjolnir, which created something of a paradox in the Marvel Universe. Could there be more than one Thor? As it happens, the answer is yes. Beta Ray Bill is a cyborg originally named Korbonite Bill of the Korbonite race, and who was created as a defender for their people. The Korbonites were amassed in a large fleet and entered the Milky Way Galaxy, fleeing the destruction of their own. When the fleet was detected entering our galaxy, Thor was dispatched to investigate. Upon arrival, he's attacked and boards the main ship, where he met Beta Ray Bill. During their fight, Thor loses control of Mjolnir for 60 seconds. If you read the comics way back when, you may recall that Thor's alter ego/human counterpart, Donald Blake, would reemerge after 60 seconds of Thor and Mjolnir being separated, and that's exactly what happened. With Blake posing no threat to Bill, he walks over and casually picks up the hammer. He's immediately transformed into a variation of Thor, with the spiffy red cape and yellow boots to match. Odin sensed what was going on and zapped the two Thors over to Asgard to address the whole "two worthy wielders" problem. Odin puts Bill to the test and deems him truly worthy of the power of Thor. He then creates Stormbreaker, a twin to Mjolnir with none of the Donald Blake-like limitations (we're sure Thor was just thrilled about that), and set loose a second Thor on both the universe and confused readers alike. Remember that awesome autonomous suit of armor in the first Thor film? That was The Destroyer, and it has a long history in the comics. Odin crafted the armor himself, and it's more a weapon than anything else, used throughout Thor continuity as a means to an end by folks like the Frost Giants, Loki, and other enemies of Asgard. It does possess some intelligence of its own, and can behave autonomously if necessary, though it is most often remotely operated by Odin. Because The Destroyer is a weapon, when controlled by someone like Odin, it can lift Mjolnir because someone who is worthy has directed it to do so. 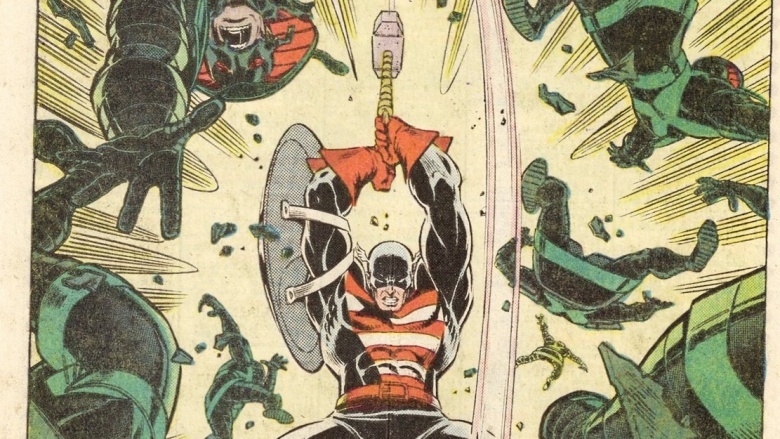 This has happened several times in the comics, but it isn't Destroyer's ability to pick up and wield the hammer that is its most impressive connection to it. That would be the battle where Destroyer actually splits Mjolnir in half! It does this with its all-too-powerful energy beam, blasting off a large chunk of the otherwise-indestructible hammer. Unworthy? No. Unbelievable? Absolutely. Back in the eighties, it seemed Thor was going through all sorts of transformations and mishaps. 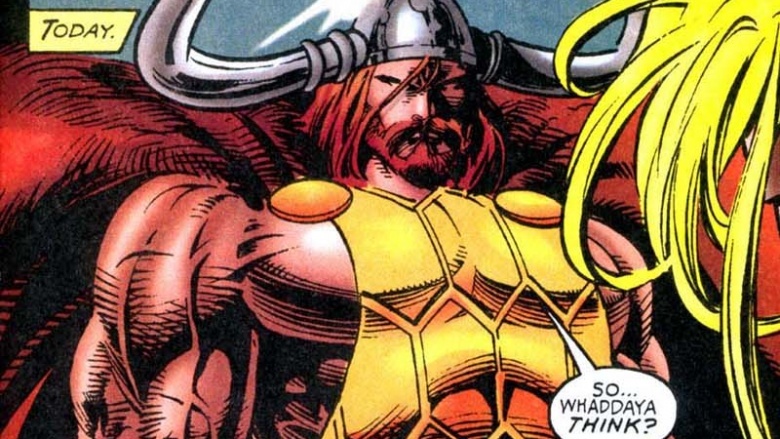 In a character redesign of sorts, Eric Masterson was brought onto the scene, and the world welcomed a new Thor with a glorious beard and mustache combo and an impressive ponytail any of Thor's enemies must have feared. Masterson was just a run-of-the-mill architect who happened upon a battle between The Mighty Thor and an enemy named Mongoose. While his name wasn't very threatening, the laser weapon he wielded against Thor was. Thor was knocked down and lost his grip on Mjolnir. With Mongoose standing ready to kill the Asgardian, Masterson ran into the fray, grabbed the hammer, and wielded it against Mongoose, who quickly dispatched and nearly killed him. Thor regains control amid the distraction and defeats Mongoose. With Masterson near death, Thor begs Odin to save his life, given his obvious worthiness and heroism. Instead, Odin bonds Masterson to Thor in the same manner he was bonded to Donald Black back in the day. What emerges is the ponytail-wielding Thor for a new age. Eventually, Thor gets into some shenanigans and Odin bans him from Midgard. He separates his son and Masterson, but leaves the human with Mjolnir and the power of Thor. After some adventuring to find Former-Thor and return him to Earth, Odin finally undoes the banishment. He realizes that Masterson should continue to wield power, but creates a new weapon called Thunderstrike, a mace, for him to use. Masterson adopts the name of his weapon as his own and goes off on his own adventures, but is eventually killed off and sent to an afterlife of his own by Odin, who clearly can't make up his mind about anything. Roger "Red" Norvell was a documentary filmmaker tricked by Loki and brought to Asgard where he met the Lady Sif, whom he was instantly attracted to. She rejected Red, which he didn't really appreciate, so he decided it would be best to pick a fight with Thor, presumably to impress her. Since fighting the Thunder God is normally a very bad idea, Loki bestowed him with Thor-like powers, along with a magical belt and gloves. Red battles Thor and defeats him, but before he can strike him down, a sound engineer on the documentary crew steps in his way, and is instantly killed. Red then takes Sif and flees to Alfheim, where she's able to convince him of his wrongdoing. They then return to Asgard to face up to what he has done. So with all that, how in Valhalla could Red be worthy of wielding Mjolnir? Well, it was all due to Odin, who anticipated Loki's betrayal and attempt to initiate Ragnarök. Once Ragnarök began, Thor would be forced to fight the Midgard Serpent, Jormungand, and was prophesied to die. Odin created the contingency of another being able to weird Mjolnir in place of his son, were this to happen. Thus, when Red returned to Asgard, he fulfilled this role, battled Jormungand, and was killed. Because of his sacrifice to Asgard, he is taken to Valhalla, where he's later resurrected and given a new hammer, called Crusher by Odin, after Thor and his father have a falling-out (they do that kind of a lot). When Red and Thor finally reunite and fight, the two realize each other's' worth, and Thor understands that both Midgard and Asgard require the protection of a Thunder God, so they both remain in their respective roles. Dargo Ktor, also known as Future Thor, comes from the 26th century, a time when corporations have (officially) taken over the world. Among the many rebellious factions exists a group called The Cult of the Hammer. You might have already guessed what they worship. With Mjolnir in their possession, the people try to find one who's worthy and will free them from the evil of the corporations of the world. Basically, it's the King Arthur story, with Mjolnir standing in for Excalibur. Ktor was just another of these rebellious folks until he was thrown into a fight involving Loki, whom The Corporation hired to take out the rebels. During the fray, Ktor reached for a weapon to help save himself and his friends and … can you guess which weapon he accidentally grabbed? Being the only one there worthy of the Hammer, Ktor transforms into Thor and wins the day. Loki is defeated and the leader of The Corporation is killed. With the world heading in the right direction, Ktor uses the hammer to open a portal in time. He throws the hammer through it, so that it will find its rightful owner from the past, because what's a comic book future if it can't revert back to the status quo quick as can be? Yep. Stan Lee, the man who started it all (maybe, as we debated in the past), has indeed lifted the hammer of Thor. How could this be, you ask? Well, the man who created Thor back in the '60s, and who came up with all the rules and regulations regarding who could lift Mjolnir obviously could've written himself to do it, but it wasn't Lee who came up with the idea. Rather, it was Warner Brothers, the people behind the Lego series of video games. While dusting in the Avengers penthouse in the aftermath of the Ultron section of Lego Marve'l Avengers, Stan Lee's Lego counterpart casually picks up Thor's hammer so he can get at the dust beneath it. He then realizes what he is holding, when he accidentally shoots off a bit of lightning through the room. With a degree of nonchalance only someone as awesome as Stan Lee could achieve, he quickly replaces the hammer and whistles his way off-screen. It's a funny gag at the end of a great game, but it definitely reinforces what many of us already knew: if anyone's truly worthy, it's Stan Lee. Hey, if you made it this far, you must really love Mjolnir. As it turns out, things haven't always been roses and unicorns for Thor's smashing stick. Read on to see all the times Mjolnir has been destroyed. How many times has Thor's hammer been destroyed? There are only three things you need to know about Thor's mighty hammer: it's named Mjolnir, only the worthy can lift it, and it can smash just about anything. But what happens when the smasher becomes the smashed? 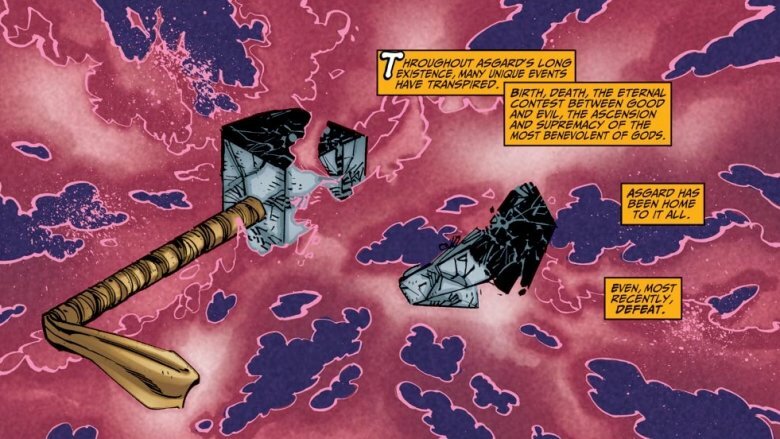 Despite its exalted status as the ultimate mystical weapon of the Marvel Universe, Thor's hammer has been broken more than a few times. Fortunately, Odin provides a pretty sweet hammer warranty program and Thor always manages to get a new one, but just how many times has Mjolnir been obliterated? Here's a look. Thor made his first appearance in 1962's Journey into Mystery #83, and he only managed to keep his hammer in one piece until 1965. The mighty Mjolnir experienced its first big break when it was sliced in two by the Destroyer, a magical living armor infused with the power of multiple gods during the events of Journey into Mystery #118. In "To Kill a Thunder God," Loki's machinations cause the Destroyer to be set free from an ancient temple on Earth, which is more or less the storage unit of the Gods, where it tangles with Thor. When the Destroyer picks up Thor's un-pick-up-able hammer, you know things are going down. 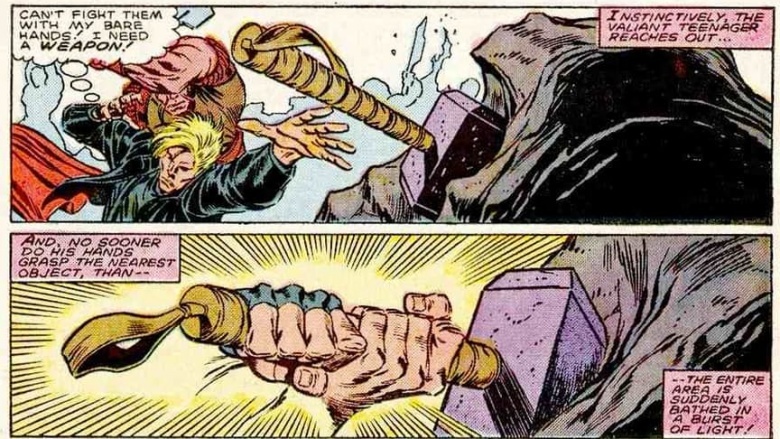 When Thor reclaims his hammer after losing it in battle, the Destroyer shoots a bolt of "limitless force" from its fingertips and slices the hammer in two. Thor continues the fight by using the powers of Loki's magic stones, but it's clear that the Destroyer is capable of using "every force in the universe" (mostly because it screams exactly that). Odin eventually intervenes and saves Thor's blonde bacon, but Thor still has a busted hammer to think about. Obviously, the next step is to swing on through Pittsburgh and fix it in one of their many 1960s blast furnaces. Forget about forging Mjolnir in the heart of a dying star; the real heat is in Pennsylvania. When your mom names you "Owen," there's a pretty good chance you'll have to turn to villainy just to survive high school. Such is the case with Owen Reece, a.k.a. Molecule Man, arguably Marvel's most under-appreciated villain. Capable of rearranging matter in any way he can imagine, his powers are nearly limitless. Seriously, the guy hasn't even been given a proper action figure, but we have one of Death's Head II? Where's the love? For all of his power, Molecule Man is very dumb. When he appears in Avengers #215, he decides to dress up like a shrimpy Galactus after chatting with the Silver Surfer and developing a man-crush on the Big G. He also decides to eat the Earth, just for fun. He builds a domed palace in New Jersey (again, the guy is very dumb), and when it's breached by the Avengers, he vaporizes their weapons with a thought; Cap's shield, Iron Man's armor, and Thor's hammer are all casualties. After a two-issue battle, the villain has a change of heart, thanks to a punch in the nose and a serious talk with Tigra. He reconstructs their gadgets and anti-climactically agrees to therapy to deal with his unending nerd rage. He can re-assemble a magical hammer at the atomic level, but he still can't figure out how to make Oreos. 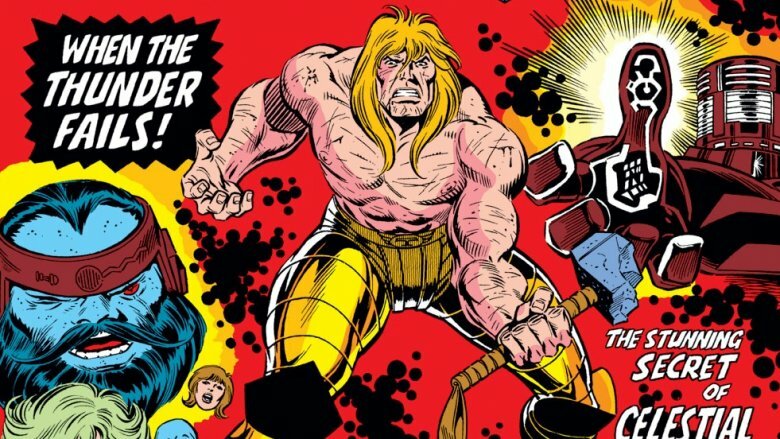 The '80s were pretty rough for most comic characters, and Thor was no exception. In 1988's Thor #388, the Norse hero had to face the Celestials, Marvel's race of supremely powerful, universe-shaping gods. Exitar the Exterminator, a 2000-foot tall Celestial, decided to pull some Galactus-level cleansing nonsense on the planet of Pangoria, and Thor tried to stop him by flying up to his head and smacking the heck out of it with his hammer. After cracking the god's helmet, he was transported to a psychedelic dreamscape inside Exitar's mind. Fighting through the Celestial's body, Thor eventually reached the creature's core, wrapped his magic belt around his magic hammer—and blasted it so hard that Mjolnir exploded. The Celestials' plan succeeded nonetheless, and Pangoria was blanketed by their cleansing energy. They also proved there were no hard feelings by restoring Mjolnir to full functionality. Turned out the Celestials were only there for a little light ethnic cleansing, and all the "pure" people were safe all along—meaning that while they fixed Thor's hammer, they're still pretty much kind of terrible. If the '80s were rough for Thor, it isn't like the '90s were any easier. In 1999's Thor (v.2) #10, he faced Perrikus, kind of a goth, bizarro version of Odin. A "Dark God" of infinite energy, he's very capable of physically beating Thor to a pulp, but when his Dark Gods took over Asgard, Thor wasn't going down without a fight. When he whipped his hammer at Perrikus, the villain had no problem simply slicing it down with his scythe, which is presumably made of unlimited energy. Thor got smacked around for a little while, even reverting back to his non-godly human form, before he just kinda put the hammer back together with his bare hands. That's it. 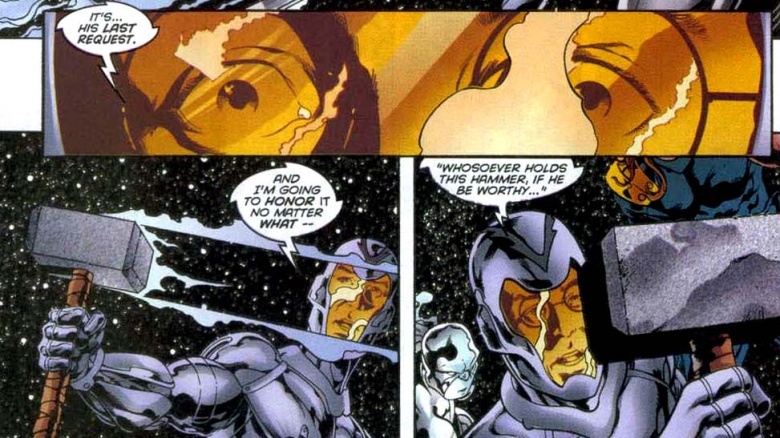 The comic explanation is that the hammer responds to its true master's touch and mystically repairs itself, but that really would have come in handy all those other times Mjolnir was busted. The new millennium just made things even worse for Thor's poor, beleaguered hammer, which by this point had undergone more repairs than your average Datsun. In Thor (v.2) #80, Loki discovered the forge where Mjolnir was made and used it to create a few hammers of his own. While they were less powerful than the real deal, there were also more of them, and he handed some of them out his son Fenris, Ulik the troll, and the giant Hyrm. When the three hammer-holders clashed with Thor, their weapons all collided, and the impact was enough to crack Mjolnir. 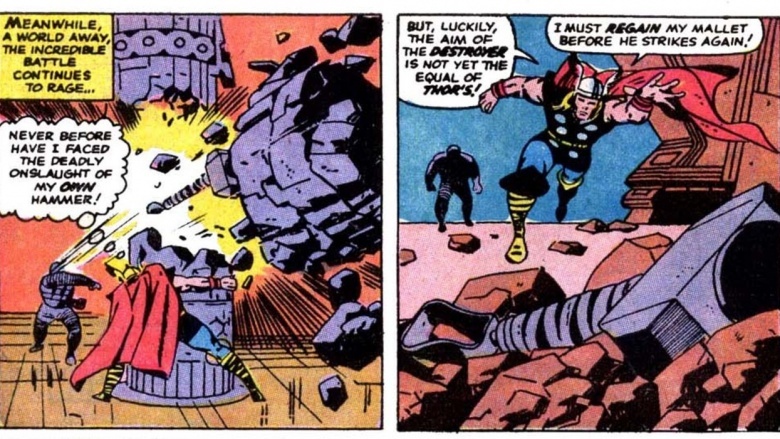 Even though his hammer was visibly busted up, Thor still continued to use it without any real problems, so its dramatic destruction basically amounted to cosmetic damage. And while Thor could have re-forged the hammer himself, he brought it to the evil Surtur to reconstruct, promising him a clear path to come and destroy Asgard in return… mostly because a vision quest and a ghost kid told him to. 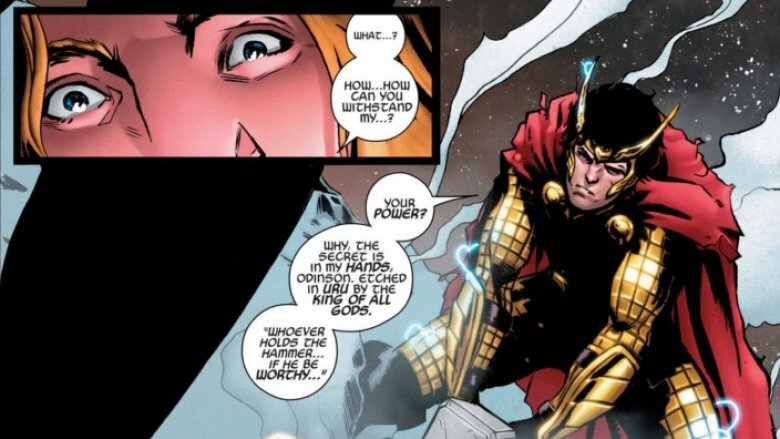 In Thor #600 (2009), Loki was once again responsible for the destruction of Mjolnir—but this time, he achieved new levels of jerkness by making it very, very personal. In the story, the god of mischief sent his own exiled grandfather, Bor, to Earth, afflicting him with a spell that caused him to see skeletal demons everywhere. Bor, being the father of Odin and also Thor's dear ol' grandpappy, was extremely powerful—heck, he was once the Lord of Asgard. Unfortunately, because Norse god royalty doesn't seem to be that close and doesn't have access to Ancestry.com, Thor and Bor had never met, and they didn't realize they were related when they had their massive New York City smackdown. Thor ended up killing Bor, but his hammer shattered in the process. This, of course, is exactly what Loki wanted. According to Asgard law, Thor had murdered royalty, and was cast out of Asgard forever. Without his home, his hammer, or his Asgardian allies, Thor visited Doctor Strange, who was able to cast a magic spell that repaired Mjolnir, but tied Thor's life force to the hammer—meaning that the next time it was broken, that'd be it for him. The hammer lived to bash again, every swing a threat to Thor's existence.